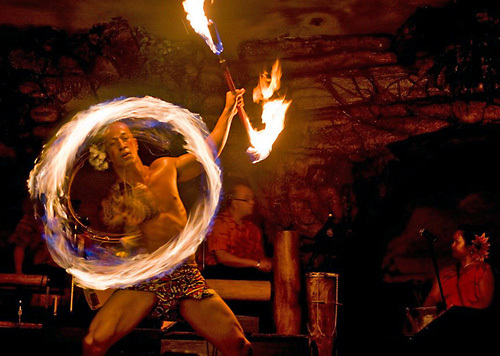 Featured at the Hyatt Regency Maui Resort and Spa on Kaanapali Beach, this exciting luau takes guests on a thrilling Polynesian adventure through an elaborate imu ceremony, traditional arts and crafts demonstrations, a symbolic torch-lighting ceremony, and an exotic Hawaiian buffet feast. 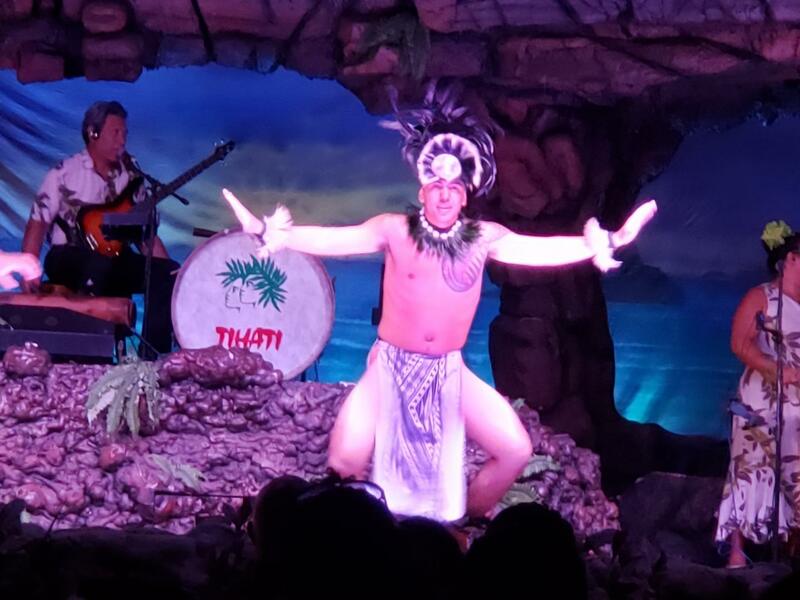 Guests of “Drums of the Pacific” Polynesian Spectacular are greeted with shell leis upon arrival and wished farewell with a beautiful Polynesian fashion show. Located at Hyatt Regency Maui Resort, just steps from Ka’anapali Beach. Bring a camera to capture memories of the gorgeous sunsets on the beach. Traditional arts and crafts demonstrations. Authentic imu ceremony: the unveiling of the main dish, Kalua Pua'a. Open bar featuring beer, wine, mixed cocktails, mai tais, and more. For a beachfront luau in Maui, you can't beat Drums of the Pacific. 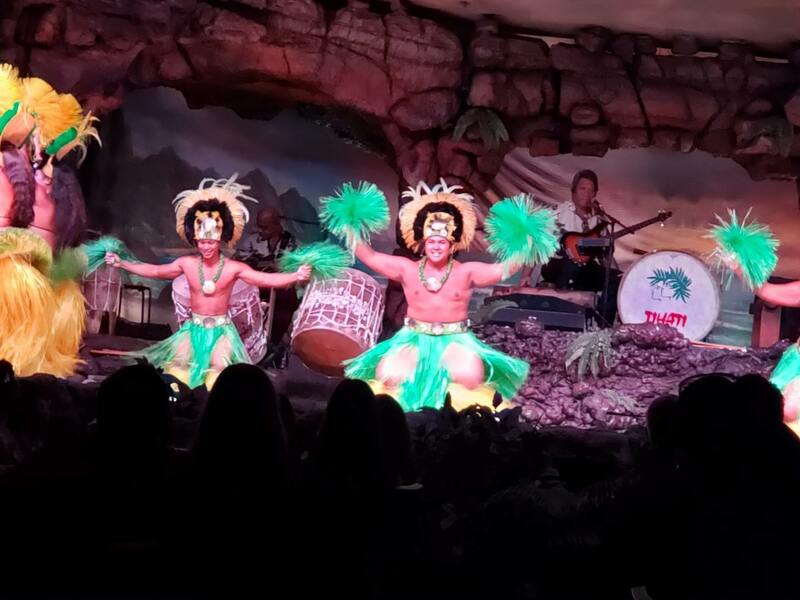 The mai tai's are endless, and so is the buffet, while the hospitality makes you feel like you’re not just watching the show but a part of the show! 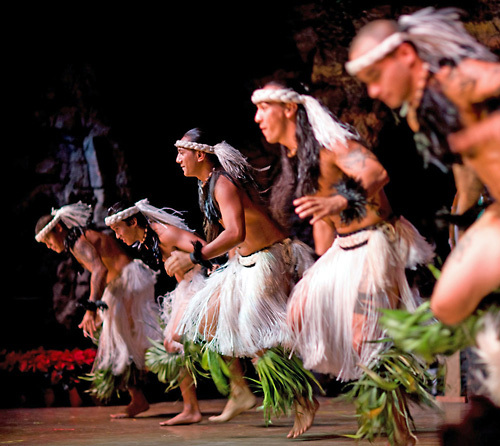 The sound of the conch, the beating of the drums and the echoes of the Hawaiian chant signal the start of Maui’s most exciting Polynesian Lu’au – Drums of the Pacific. 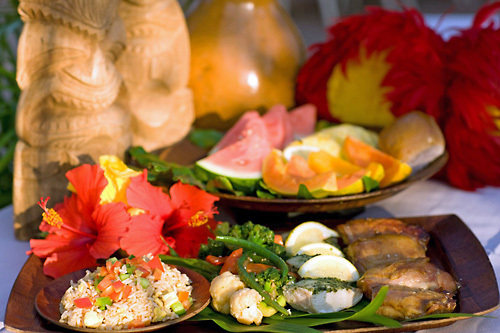 In the authentic Hawaiian tradition, native crafts and customs are demonstrated including the unearthing of the freshly roasted pig from the Imu. 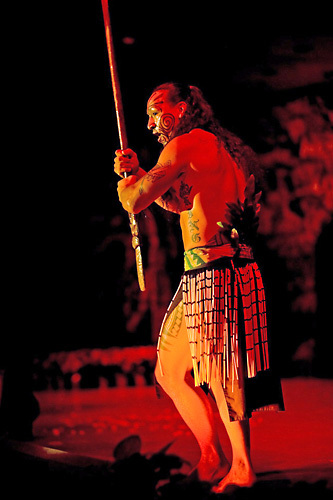 A cast of 18 dancers and musicians will perform the songs and dances of their Polynesian ancestors from throughout the South Pacific including a thrilling Fire Knife Dance finale. An all-you-can-eat generous buffet including Kalua Pork, Huli Huli Chicken, Mahi Mahi, Polynesian Rice, Vegetables Makamaka, Tropical Fruits Anuenue, Soba Noodles, Lomi Lomi Salmon, Pacific Ahi Poke, Tossed Green Salad, and Poi (taro). Salads and Starters: Polynesian Rice, Baked Kula and Hawaiian Sweet Potatoes, Vegetables Makamaka, Tropical Fruit Anuenue, Soba Noodles, Roasted Wedges of Maui Onions, Lomi Lomi Salmon, Pacific Ahi Poke, Tossed Green Salad, Kim Chee, and Poi. "a feast for your eyes"
Our group of five did premium seating which was excellent. They are well organized and the performances were exceptional. The MC is light and cheerful. 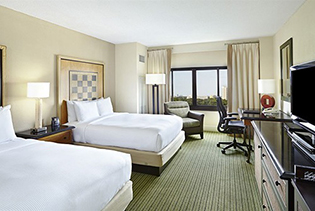 The Hyatt is a beautiful property and you may want to allow extra time to enjoy the setting. The buffet offered a good selection and the food was good. 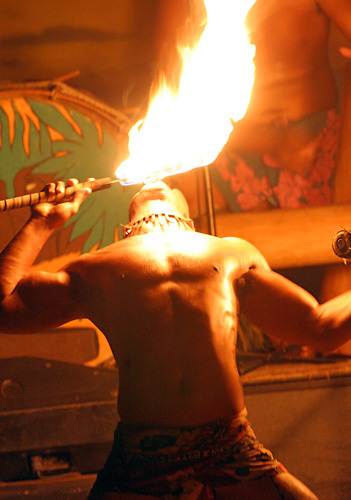 This is the first luau we have been to, but it was a great experience. Everything was well organized, the food was great (and very plentiful), and the show was great. Everyone there was having a very good time and servers were very friendly. 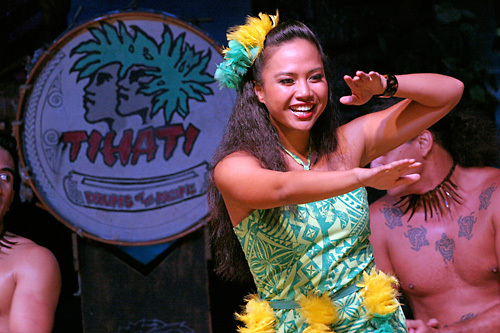 In talking with others across the table from us, they said that they had attended other Luaus but like this one best because the show covered some of the history of the Polynesian islands and showed dances and stories from each. 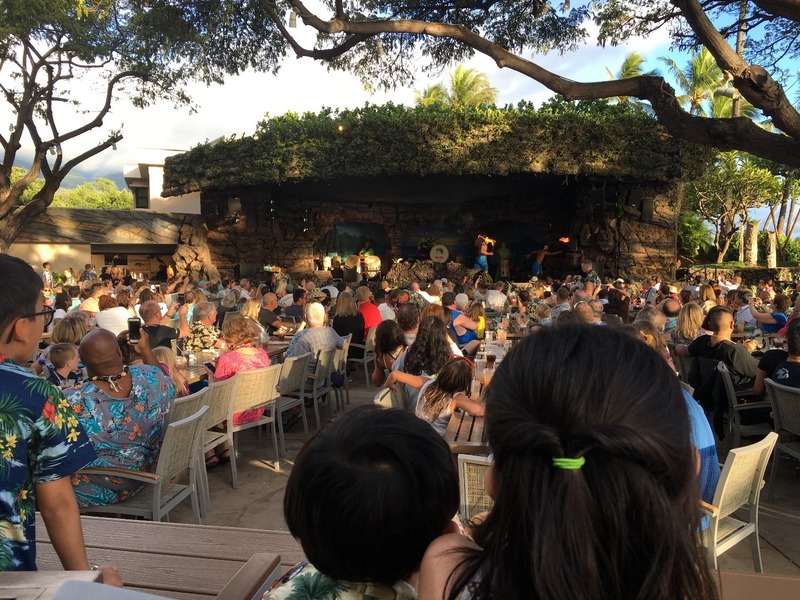 Tip: The Luau is behind the Hotel (Google Maps was misleading). You can park in the main parking lot and walk through the lobby or park in the beach access parking and walk over. Although we were an hour early, the line if several hundred guests had only two greeters, thus we missed most of the opening part of the show. The drink ice had melted so a second line for drinks was undertaken. After that, a line for food, then for desert. We noticed several elderly guests with mobility problems for which no help was offered (other guests did step in). The drinks were watery, the food ok, the show might have been nice but I did not see much. For the money, treat yourself to a restraint and watch clips on tv. This is a great event for the entire family! From the moment you enter the staff takes great care of you and over 200 people are fed in a process that's like a well oiled machine. I was amazed at the level of professionalism of the staff and the pure enjoyment that my family (4years -55 years old) experienced. The dancers captivated the attention of my 4 year old son which is a challenging task in itself. 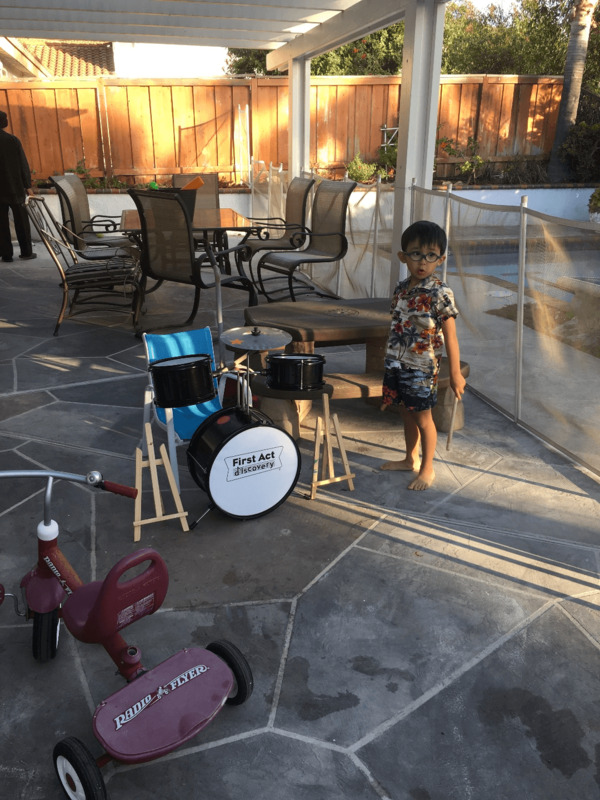 We are back in San Diego and he still talks about the DRUMS OF THE PACIFIC performance. 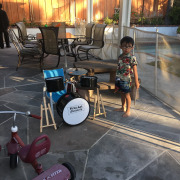 Yesterday, on his own, got dressed in his button down Hawaiian shirt (he detests any type of button shirts) and Hawaiian shorts, moved his drum set to the backyard (because the performance in Maui was outside of course) and demanded that grandma and grandpa sit for his version on DRUMS of the PACIFIC. 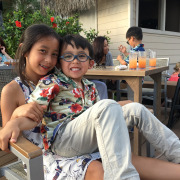 I share all this to say, if you have little ones, it will be a memory that will stay with them far past the thrill of the airplane ride, pools, beaches, submarine rides, and road to Hana trips. This is definitely something you have to add to the to do list. The food was great and plentiful! The hotel was absolutely gorgeous! My family loved the table for 8 on the back patio seating area in the general section that is near the bench railing! Perfect for the little ones to see above the rest of the crowd. Tip: If you have little ones, sit at the table on the back stage nearest to for railing. Perfect spot! 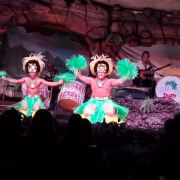 "Drums of the Pacific luau"
The show was pretty good, nothing too special though. The food was decent; again nothing to rave about. I think it was be really fun for kids & ppl in their preteens as well. Tip: The tickets to this event was a tiny bit pricey. 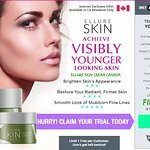 Use your money for something else like surjing lesions. Got VIP tickets, but that only meant our table was in the first row. You still need to get there early to get the best location. Children loved the show, the adults enjoyed the show. While the food was okay, I had expected more and better. We loved it. We paid extra for VIP seats and sat in the front. 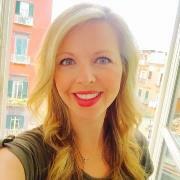 Great with two kids. We also ate first. Drinks were included. The show was really really good with and old school Hawaii MC. They started on time, they ended on time. They validated parking. All good. 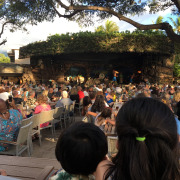 We had been to the Old Lahaina Luau pre-children and were looking for a luau that would be better suited for children. Based on the reviews we picked Drums of the Pacific Lu'au. The first 3/4 of the show was just bad - boring & dull. Fortunately, my children were so tired from a day in the ocean that they sat there but they were definitely not entertained. The "finale" with the drums and the fire was great - but this really represents 30 minutes at most and based on what we paid (for VIP seating), was definitely not value or even a fair price. 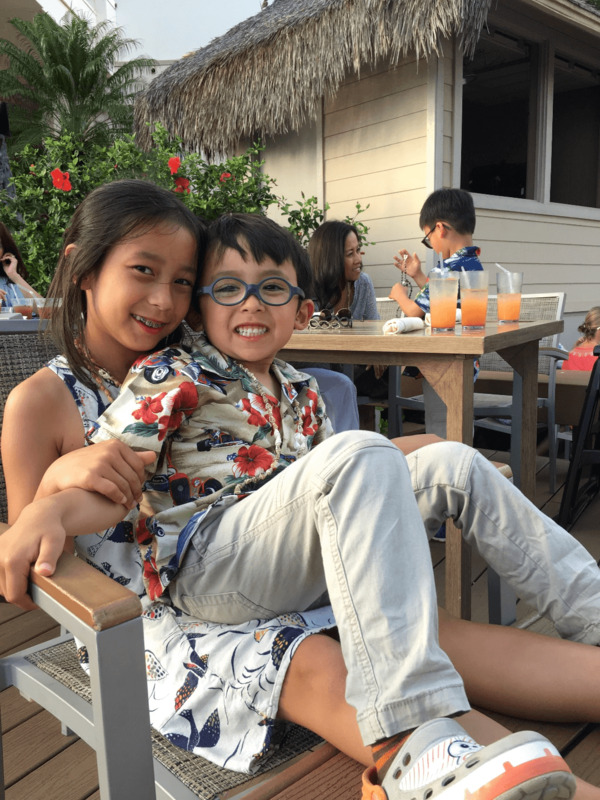 The food was fine - didn't exceed expectations (which were low) and didn't fail to meet our low expectations for a luau buffet. Spend your money elsewhere. Very colourful show. Had VIP seating so were front and centre. Drinks free but pretty weak. Buffet menu was good I thought but did hear a few complaints. Dessert was awesome. Dancers put on a good show and fire eaters were great. Got a bit of history in the process. Can park at the Hyatt and servers can validate ticket for free parking. It's well marked. 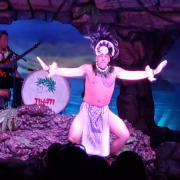 "First Luau - great show, ok food "
This was our first time to Maui and searched a few luaus and finally decided on this one. Signage wasn’t the best to get to the location but when we made it we were impressed with the setting near the beach. The food was just OK but the show was entertaining. Big negative was the washrooms. The one outside along the beach closed early then there was only one working bathroom near the kitchen of the Luau. I would recommend this Luau if you haven’t attended one before but not sure if I would come back to this one. 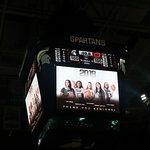 What is the difference between General and Preferred Seating? The General seating table assignment is best available upon purchase in the general section and includes a Shell Lei greeting. Seating begins at 5:30 pm (April - Sept). Preferred Seating is best available in the center tables, 2nd row from the stage with fresh handmade Ti leaf lei. Seating begins at 5:15 pm (April - Sept). 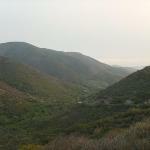 Where is Drums of Pacific located? They are located in Lahaina at the Hyatt Regency Maui Resort and Spa. Join us in Sunset Terrace, just steps from Ka’anapali Beach.